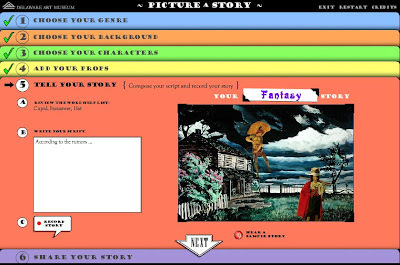 Picture a Story is an online story editor from The Art of Storytelling (via The Delaware Art Museum) that allows kids to choose a genre, background, characters, props, and then write a story. The site asks to connect to your microphone/camera first, but if you don't want that, you can say no and still continue to compose a picture and type in a story. Genres cover fantasy, fairy tale, western, romance, horror, drama, adventure, mystery and comedy - something for everyone! Characters, backgrounds and props don't seem to change much according to genre, but there were enough to keep me amused. 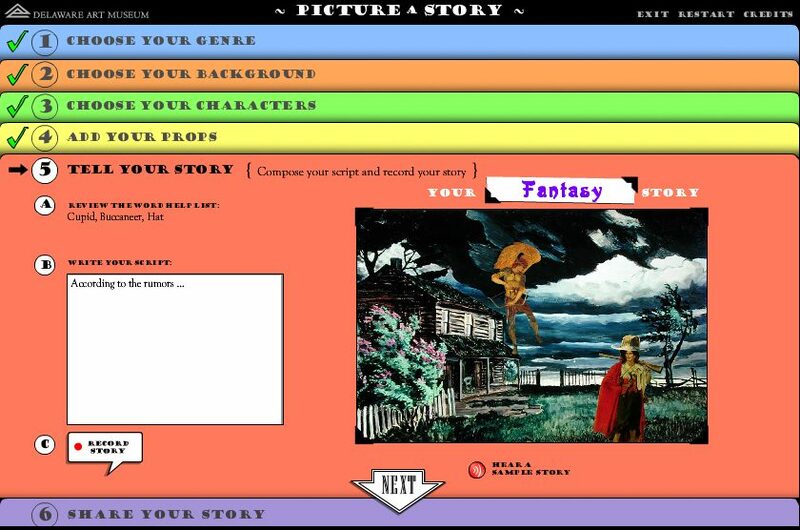 The feature I liked was that you can listen to a sample story which might lead you to a story of your own. Kids will enjoy putting disparate characters together like a fish and a warrior into a romance. I also liked that there was a page of directions to make really clear to people how to go about doing the activity. The process is simple, but still, it's a nice touch to explain in case someone has trouble. And there's a special resource page for teachers with downloadable lessons. 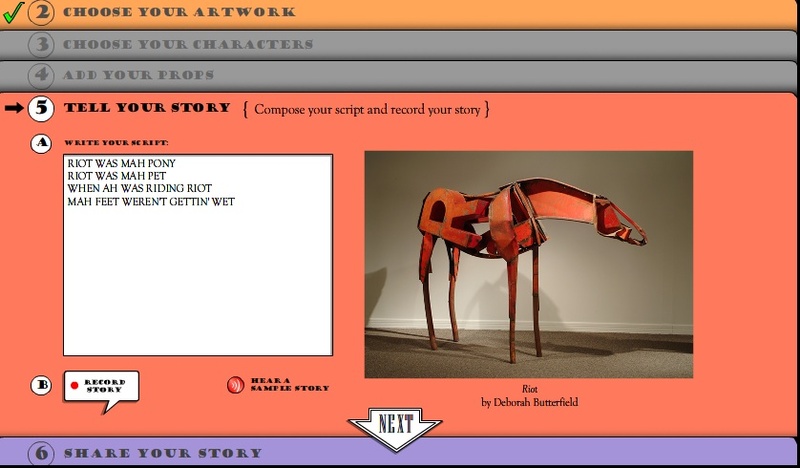 When your story is done, you can share it via email, and/or ask that it be considered for sharing on the Art of Storytelling website. 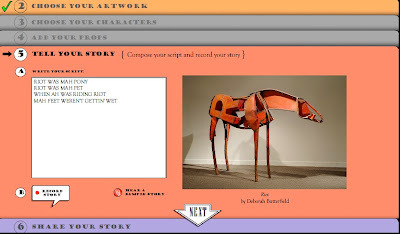 You can experience other kids' stories via the Art of Storytelling home page, or go on to a different editor called Tell a Story that allows you to choose an art work to be inspired by, and write about it. Once upon a time there lived a beautiful damsel named Corinnabelle. One day she walked outside her cottage, sighing and wishing for a pet to call her own. Suddenly, she heard a low growl, and the hairs at the back of her neck prickled. She looked up and saw a hideous tree goblin leering above her. "Promise me your first-born, or I will plunge my golden dagger into your heart," said the tree goblin. Just at that moment, Corinnabelle heard another growl. It was a wolf! The wolf sprang at the tree goblin and ripped it to shreds. Then it ripped Corinnabelle to shreds too, and retired to the forest, licking its bloody maw. Moral: never trust tree goblins or wolves.